What is Shock Hair loss after Hair Transplant Surgery ? Shock loss is a common occurrence that happens after a hair transplant. In a nutshell, it involves hairs falling out a few weeks after your surgery. Shock loss occurs when the native hair is weak and isn’t strong enough to resist the surgical trauma that is going on around it. More often than not the hair that has gone into shock will grow back but after 3/4 months – after the resting phase. 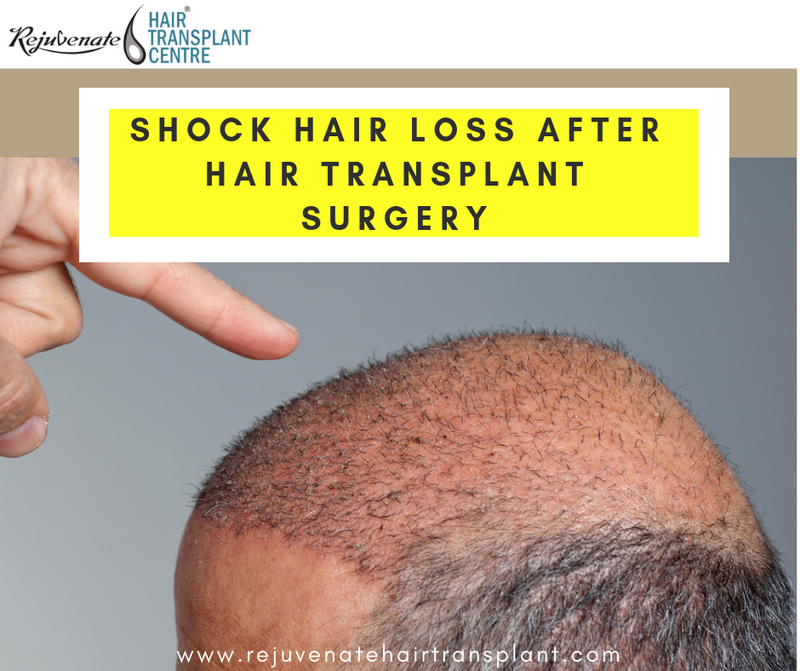 Shock loss can occur both in the donor and recipient area a few weeks to a few months after having hair transplantation surgery. Effecting less than 5% of all hair transplant patients, it is temporary and any lost hair should reappear in short order. When you undergo hair transplant treatment, the standard procedure constitutes the physician to remove small grafts of hair follicles from a donor area on your scalp and then re-implant those grafts into the recipient area(s) of your scalp. Unless you’re completely bald and the hair grafts were extracted from other parts of your body, the recipient area typically has some healthy growing hairs surrounding it. Due to the initial trauma or “shock” of performing such an invasive procedure, some of those healthy hairs in the surrounding areas might fall out after a few days. This is what’s referred to as shock hair loss in the hair transplant industry, and it’s perfectly normal. For better understanding – for example, during a (follicular unit extraction) FUE, we remove follicular units one-by-one. Donor’s hairs are removed with a one-millimeter punch device and the procedure is abetted with a head positioning device to minimize movement. As precise and advanced as this process is, the removal of donor’s hairs can impact nearby follicles and this trauma can cause them to fall out after the procedure. Understandably, some patients are troubled by this occurrence if they haven’t been properly prepared for its possibility. It’s the responsibility of your hair transplant surgeon to explain the possibility of shock hair loss during your initial consultation. In fact, they should be preparing you for any other factors that might affect you as well. It’s important to understand that shock loss isn’t the same as the natural shedding that occurs after a hair transplant. After your surgery, you will most likely lose the newly transplanted hair after a few weeks. That’s part of the process and isn’t an issue. The transplanted hair will start to regrow after another few weeks, at which point you can expect to see about a 1/2 inch of hair growth every month. Shock loss doesn’t happen to the transplanted hair. Instead, it occurs in hair that was otherwise healthy before the surgery. Using ultra refined follicular unit transplantation, the recipient incisions are much smaller and refined using custom cut blades smaller than 0.95mm which causes less trauma to the scalp. This in itself can minimize shock loss to the recipient area. Conservative placement around existing hairs without super dense packing can also minimize shock loss to an existing area. Use of FDA approved hair loss medication such as Propecia (finasteride) and/or Rogaine (minoxidil) to strengthen the miniaturized hairs 6 months to 1 year prior to hair restoration surgery. Shaving the recipient area will minimize the risk of native hair loss as it is easier to determine proper angle and see in between the existing native hairs, thus minimizing the risk of native hair transaction. This is especially true for transplanting hair into areas with a lot of native hair. Shock loss occurs when the patient’s native hair is weak and isn’t strong enough to resist the trauma (surgery) that’s going on around it. In most cases, the hair lost during shock loss will grow back after a few months. Any hair that goes into shock and doesn’t return is hair that was destined to fall out anyway. Increased trauma will increase the chances of shock loss so it’s very important to follow all post-op protocol as recommended by your specialist. Take it easy after surgery – avoid bumping your head, avoid direct sunlight on your scalp. Shock loss is unpredictable and there isn’t anything that patients or specialists can do to lighten the risk. Shock loss tends to occur both in the recipient and in the donor areas. It’s a normal response to trauma to the scalp.